Conversion By: Interocean Ugland Management Corp., Voorhees, N.J. as General Agent for the U.S. Maritime Administration. The USNS Tanner, TAGS-40, was built for the Navy as a fast Oceanographic Research Vessel by Bethlehem Steel Corporation at its Sparrows Point Yard in Maryland in 1990. The vessel was the second oceanographic research ship to bear the name of Zero Luther “Tanner” a noted Oceanographer and inventor of a patented sounding machine. 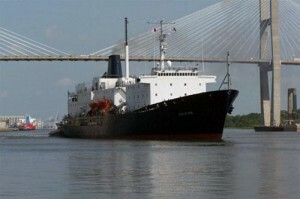 The vessel experienced an engine casualty in 1993 and was laid up by the Navy and ownership transferred to the Maritime Administration. She lay idle in the James River Reserve Fleet until 1996 when she began a conversion process, which removed her underwater sonar domes and equipment. The (2) two original engines were removed and a new “one of a kind” power plant was installed, making her into a sophisticated high tech teaching platform for her mission of training men and women for careers as licensed officers in the Merchant Marine. The vessel was renamed the Training Ship State of Maine, and was modified to increase the accommodations from 108 to 302 persons. New lifesaving equipment and upgrades to existing equipment were accomplished as well as enhancements to the habitability requirements of the vessel. She was delivered to Maine Maritime Academy on 6 June 1997 and sailed her maiden training cruise the following week. The State of Maine is currently the flagship of the Maine Maritime Academy fleet, and provides an outstanding opportunity for midshipmen to get hands on experience afloat.